A few days ago I was visiting with a colleague in his office. He was trying to find the most recent version of a particular file. He had one copy on his computer and one copy on his flashdrive, but he wasn’t sure which was the most recent. And he didn’t seem convinced that those were the only two copies. Did he have another copy on a different flashdrive? Did he have yet another copy on his laptop? Dropbox lets you get rid of your flashdrive and keep all of your files synched. Make a change to a Word document, and it’s changed everywhere else you have installed Dropbox. Dropbox adds a folder to your ‘My Documents’ folder called ‘My Dropbox’. Install it on your work computer, your home computer, your laptop. Anything you put in that folder (documents, spreadsheets, slide presentations, video, images, etc.) will be copied to the Dropbox server, and then copied and downloaded to your other Dropbox-installed computers. As well as being stored locally, your files are stored (think ‘backed-up’) on the Dropbox servers. Visit the Dropbox website from any computer and log in to access your files. This means you can access your slide presentation from your classroom’s internet-connected computer. No more worrying about whether you’ve moved your most recent slide presentation to your flashdrive. No more worrying about losing your flashdrive. Want to go back to an earlier version of a document? Visit your files on the Dropbox website. Previous versions are kept for 28 days. If you’re not sold yet, this next feature should do it. You can share your folders with other people. Add or change a file in that folder, and it changes for everyone else. It acts like a shared drive, except the files are stored locally as well. To share a folder, navigate to your ‘My Dropbox’ folder. Right click on the folder you want to share, mouse over ‘Dropbox’, then select ‘Share This Folder’. Your browser will open a page on the Dropbox website. Just type in the email addresses of the people with whom you would like to share the folder (comma separated), and click ‘Share folder’. 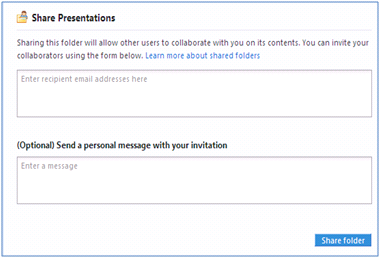 Your recipients will receive an invitation to install Dropbox, which they’ll need to do to share your folder. 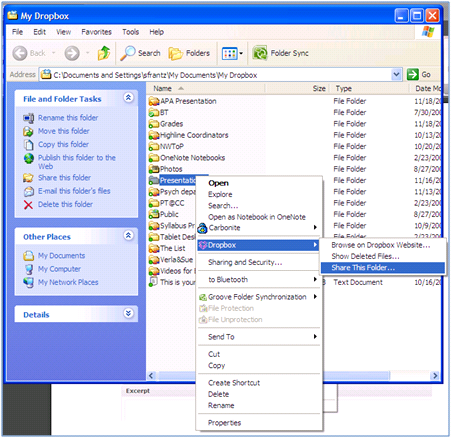 Once done, any files they add to the folder or any changes they make to an existing file will be uploaded to the Dropbox server and pushed out to everyone who’s sharing the folder, updating on all of their Dropbox-installed computers as well. Cost? You can store up to 2GB in your ‘My Dropbox’ folder for free. You can store up to 50GB for $9.99/month and up to 100GB for $19.99/month. Installation? You can install it in less than 2 minutes. What are you waiting for? Dropbox.